KP Snacks' nut processing and packing facility covers 8,500 square metres and produces all of KP's volume of nuts and nut snacks. 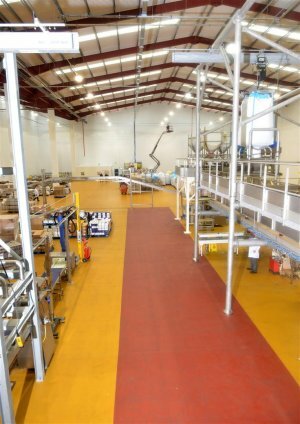 The firm required a proven hygienic flooring solution for the new production site in Rotherham, South Yorkshire. Kemtile was required to meet an exacting hygiene and safety standards requirements and to supply a durable, hard-wearing, easy-to-clean, chemical and slip-resistant surface finish. Kemtile used a heavy-duty polyurethane screed, with a matt-textured finish, suitable for use on large-scale production facilities. The manufacturers of the screed also provided a long guarantee on the system, a proven performer in the food and drink sector. Chris Fletcher, Head of Engineering at KP Nuts, said: "After extensive trials we found that the best floor product for our needs was the product recommended by Kemtile as it was perfect for our mixed use environment."